Don't feel like baking up an entire cake or just trying to limit yourself to one slice? No worries. 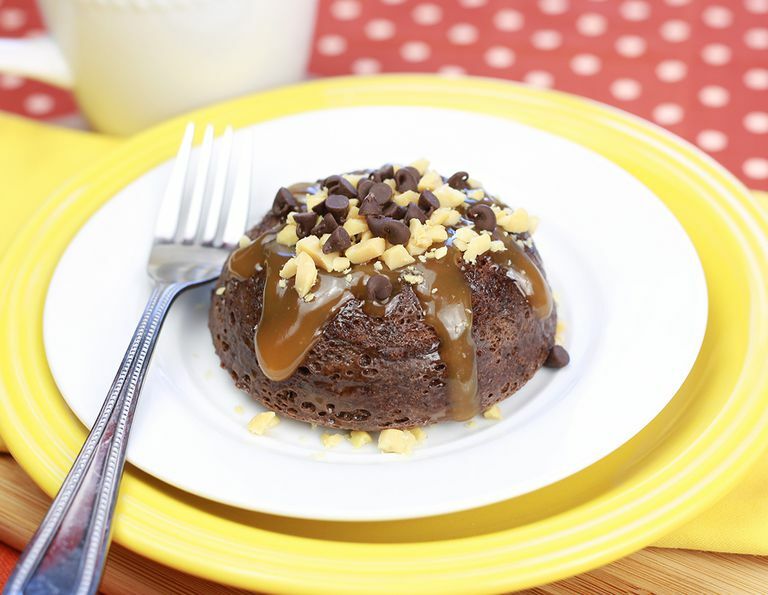 Just make a single-serving "cake in a mug." It's ready in minutes, and there's no need to share. Nonstick spray: This basic pantry item is really helpful when it comes to making microwave cakes. Spritzing your mug before you add the ingredients means your cake will easily slide out when it's done. Microwave: A standard 1,100-watt microwave is what I use, but any microwave will do. However, if you're using a microwave with a different wattage, you may need to adjust the cook time(s). Moist-style cake mix: Use good old-fashioned cake mix. Since you won't be adding eggs or oil, it's easy to turn basic cake mix into a guilt-free treat. You'll need about 3 tablespoons of cake mix for each mugged dessert you make. That amount has around 120 calories and 2g fat. Fat-free liquid egg substitute or egg whites: Keep a container of fat-free egg substitute in my fridge — you need only about a tablespoon of it to make cake in a mug. If you prefer to use whites, stick with the liquid kind that comes in containers — the consistency is ideal for these microwave treats. A tablespoon of egg substitute or whites has around 15 calories and no fat. Fat-free or light sour cream: It may sound odd, but a little sour cream adds incredible texture and richness. Add 1 tablespoon for a delicious mini cake. A tablespoon of the fat-free kind has only about 10 calories; the same amount of the light stuff has around 20 calories and 1-1.5 grams of fat. These fun toppings are reasonably low in calories, but keep an eye on those portions. Grab a measuring spoon. In a microwave-safe mug sprayed with nonstick spray, combine cake mix, egg substitute, baking powder, and sour cream. Add 2 tbsp. water, and mix until uniform.